So anyone knows what's happen? Set/change your product name, I had this issue until I created a product name as same as project name. The product name can be set in the Consent screen section of the Google Developers Console for your project. 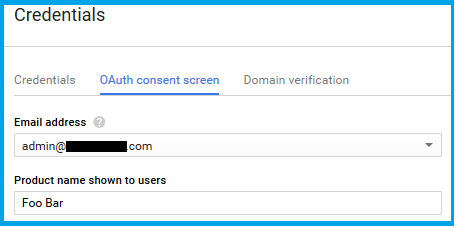 Look under APIs & auth in the left navigation and select Consent screen. You need also to set your email address in the box above the product name. And at the BEGINNING and at the END for both. Trim the leading and trailing white space from both the client_id and client_secret. Google's copy button does not do this for you. Set both the email address and product name fields for the OAuth consent screen. Setting EMAIL ADDRESS and PRODUCT NAME in the consent screen of Google developer console, solves the error "Error: invalid_client. The OAuth client was not found." for me. I had .apps.googleusercontent.com twice in my ID. in this thread i found my answer. invalid_client can also simply means that your client ID and client secret are wrong when you create your Oauth2 object. In my case this turned out to be something else, namely my code used an environment variable that hadn't been set properly (and stupidly wasnt checked by my code). Setting it, recompiling assets, and restarting the app did the trick. I solved this by removing unnecessary quotes from my clientID and clientSecret values. Did the error also report that it was missing an application name? I had this issue until I created a project name (e.g. "Project X") in the project settings dialog. Check your Project name on Google APIs console. you choose another project you created. I was same error. my mistake was choosing diffirent project. I accidentally had a value in the Client Secret part of the URL, but Google Credential does not need a Client Secret for Android OAuth 2 Client IDs. Simply leaving the value blank in the URL did the trick for me. The name should be exactly the same. When you install the GoogleAPIs into a .Net app with NuGet, it will inject a new set of dummy values in your *.config file. Check that any original values are still in place, and remove dummy entries. None of the following were my issue - I resolved this by opening an incognito window. Something was obviously being cached somewhere, no amount of changing auth client settings helped and there were never any trailing or leading spaces in config values. Deleting client ID and creating new one a couple of times worked for me. Mine didn't work because I created it from a button from the documentation. I went again to the project and created another OAuthClientID. It worked. Yes, be careful about the extra spaces on right and left too. Not the answer you're looking for? Browse other questions tagged google-oauth google-data-api oauth2-playground or ask your own question.